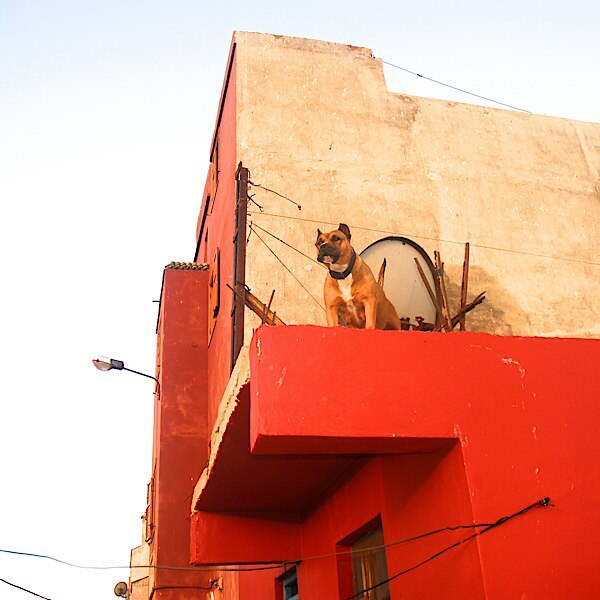 HSAM is entering the next phase of street animal welfare in Morocco; the first ever dog sterilisation and Rabies vaccination program to be carried out in Essaouira. 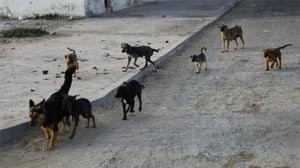 The dog population in the Medina is relatively small at present, giving the perfect opportunity to stabilise numbers before they escalate, effectively making the practice of culling as a method of Rabies control redundant. 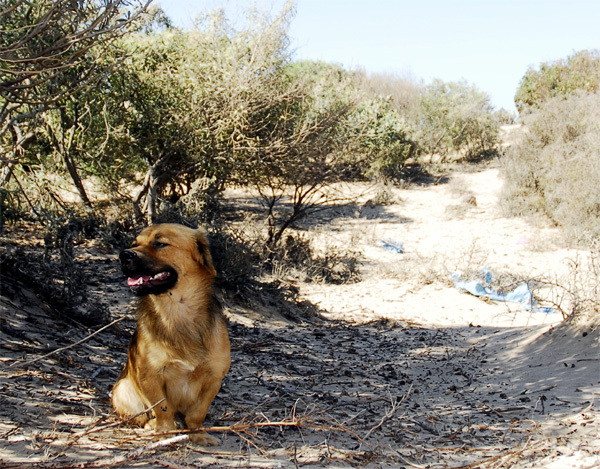 In short, HSAM’s Dog Population Management scheme will raise levels of welfare for years to come, both for the canine and human residents of Essaouira. 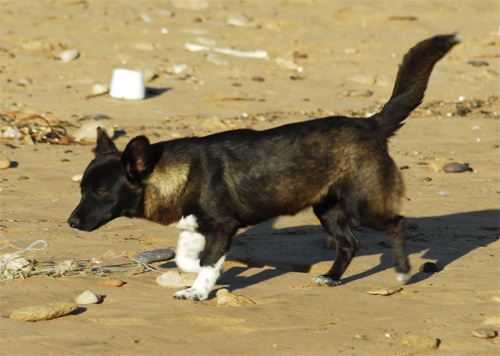 Half domestic dogs stay in residential aeras, close to the forest or the sea. 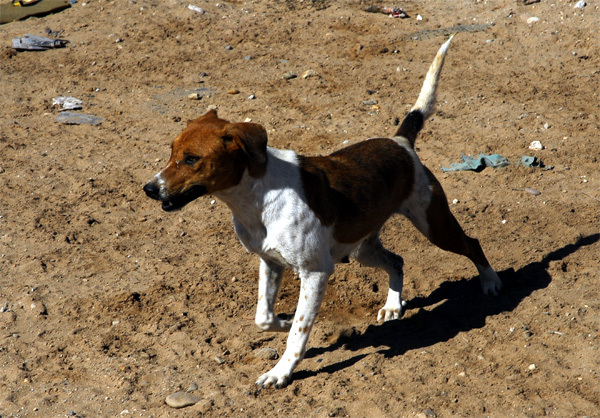 Rules the streets in the night finding food near the garbage containers or outside houses in the derbs. 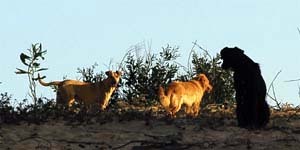 In the early morning they leave to find a more calm place to sleep, usually in the forest. They are shy for man who use to throw stones at them as a protection. 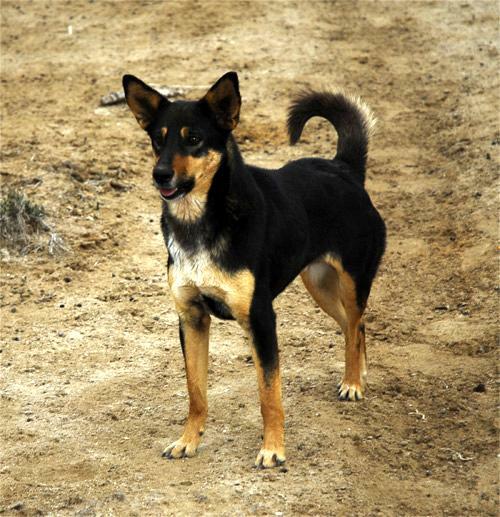 There are many dogs in the forest and some of them wild in the sense that they seldom approach man. They are extremly shy and usually hide in the vegetation when you pass by. Most of the dogs I knew last year and before are dead. Probably poisoned, but also dead of accidents, illnesses or natural causes. The dogs are usually shy and most active in the night and early mornings. Then they are sleeping during the days in a quiet safe place. 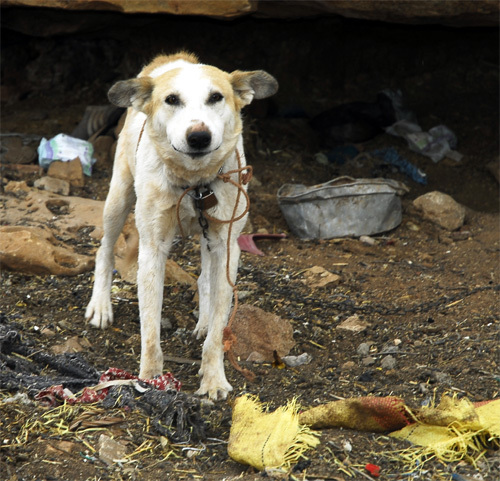 Some dogs are more domesticated than others because local children play with them in their neighbourhood an families put food beside the garbage containers to feed them. 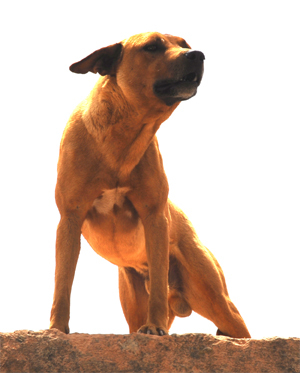 Some dogs are successful in surviving. When they give birth to cubs - sometimes more than 8.....the puppies quickly disappears. 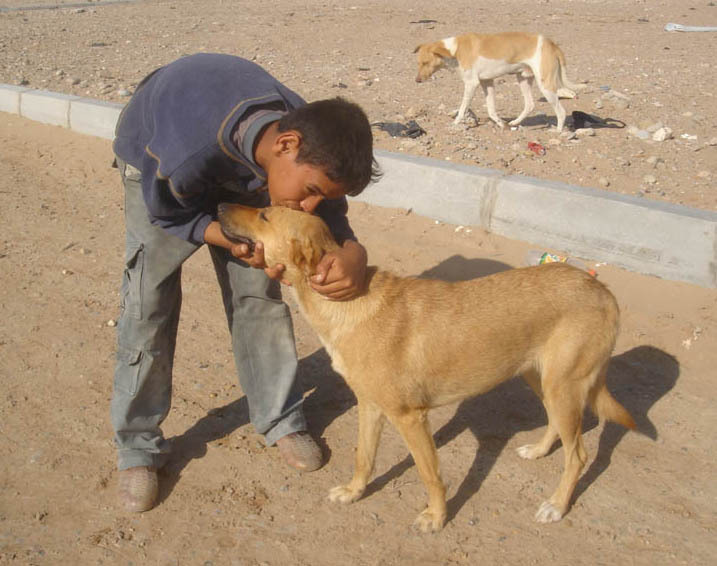 The children play with the cute puppies in the streets and even knock at my door and offers them for 10 DH or free. 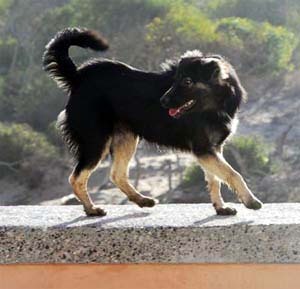 I know some people take some puppies, too early from their mothers, and leave them as watchdogs in houses in the villages around Essaouira. There I have seen bad treatment of them. They put a chain around their neck, about 2 m long outside their house and and let them there just feeding them occationally. 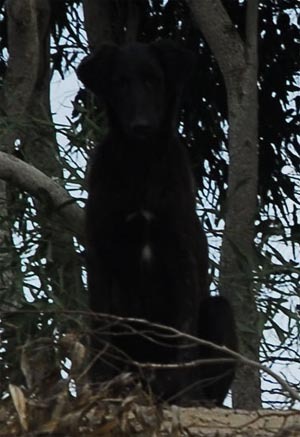 The purpose is to have a watchdog - barking when someone approach the house. Without exercise and affection they soon die. 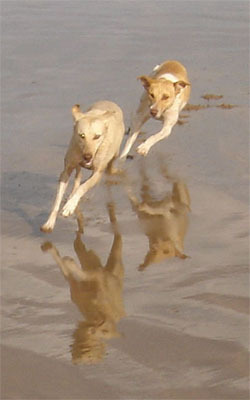 But the most common attitude to dogs is to throw stones at them and not be close or touch them. 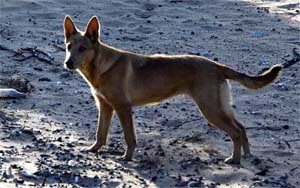 Therefore they are mostly shy and well disciplined.....they don´t approach man easily. 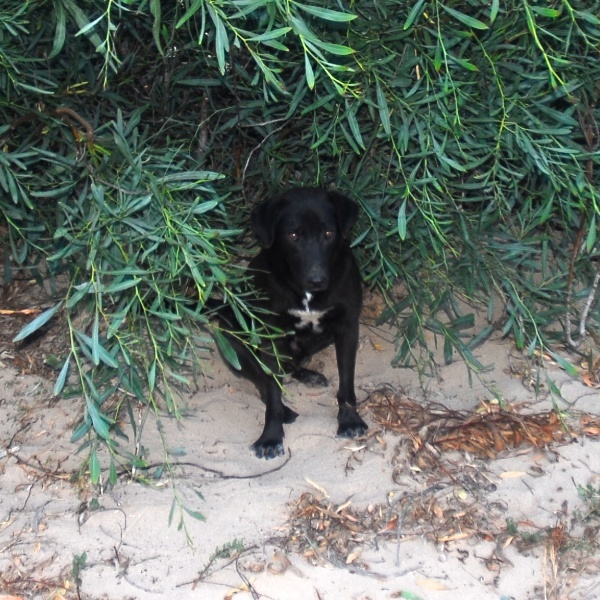 I love the dogs and when they feel comfortable and are not afraid they are very affectionate and they like to walk with me in the forest or at the beach. 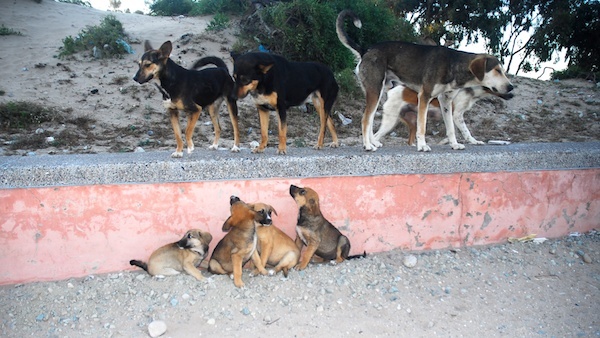 They are very curious but cautious exploring the beach, the forest and the lagoons. They have a distinct hunting instict but they never have a chance with the birds. Sometimes they chase cats but always loose a fight. 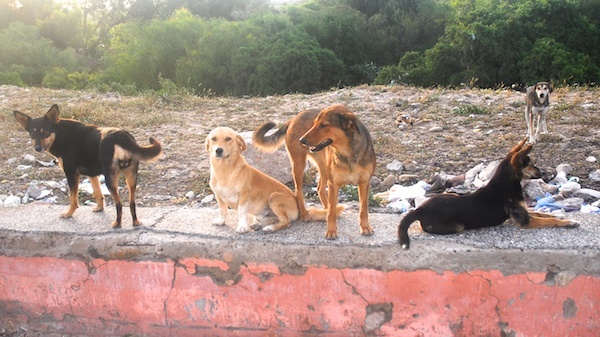 When the pack follow me to the street where I live I just tell them to go away and they understand. 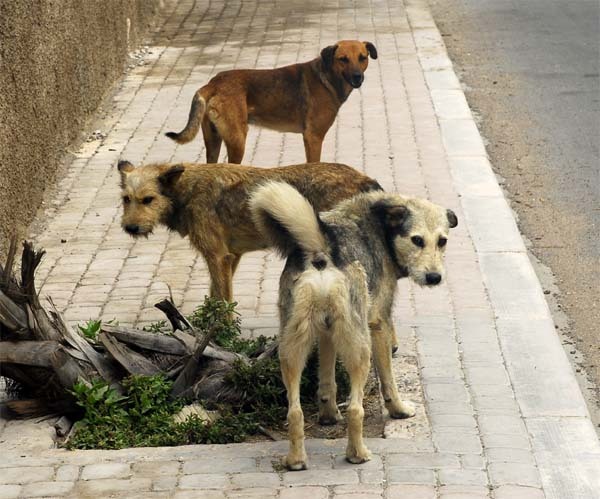 That is important because people are afraid of dogs and never let them in their house or want them in the neighbourhood and you only walk with a pack of dogs in the early morning when streets are empty. But the dogs like to bond with man. 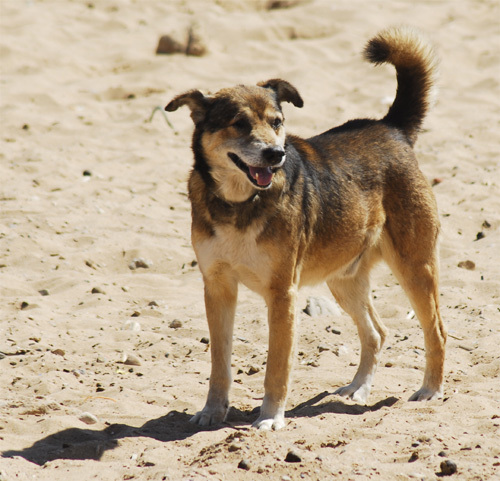 Nina (2003 - 2009) Raised in derb Bouhaira. 4 litters. 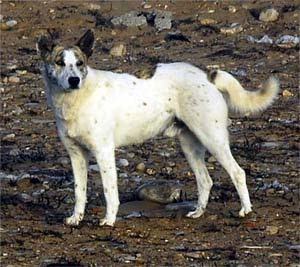 A typic domesticated street dog. Dead by poisoning. that they are unclean and must be treated in a certain way. 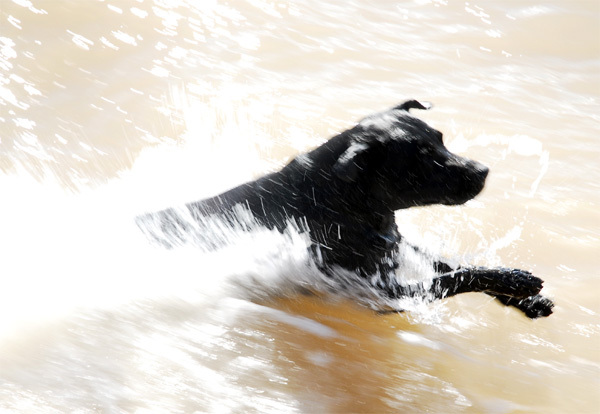 If you serve a dog water in a bowl - you must clean it seven times after. A black dog is a devil. Hair from dogs are unclean and distracts from prayers. 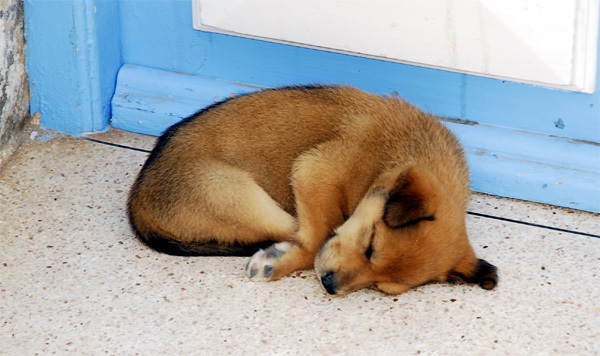 You don´t let a dog enter a house and certainly not sleep in your bed. 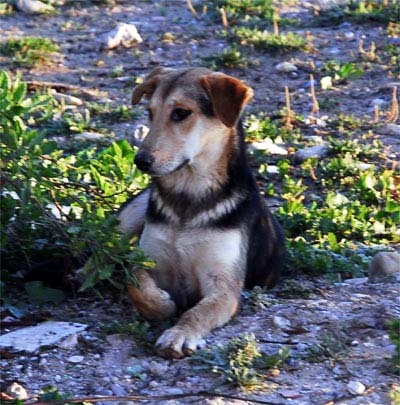 The street dogs of Essaouira are not aggressive, they are afraid of people. It is common that they dont like "dirty people", like drunkards or people looking for garbage in the containers and they could then bark. In that way they keep the block clean from such problems. They learn quickly who is good and who is bad. Health. 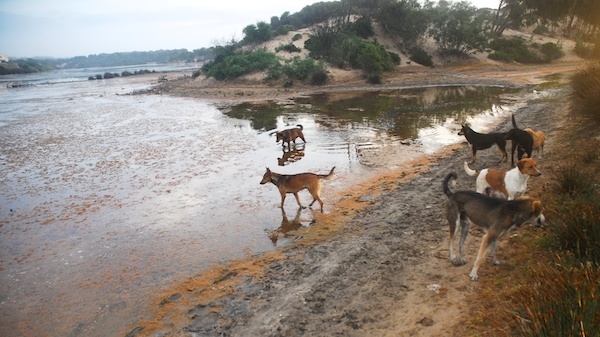 The dogs who live at the beach (Pack Bhar), just north of the ramparts of medina, seem to be clean and in good health. Fishermen give them fresh water and also some food. 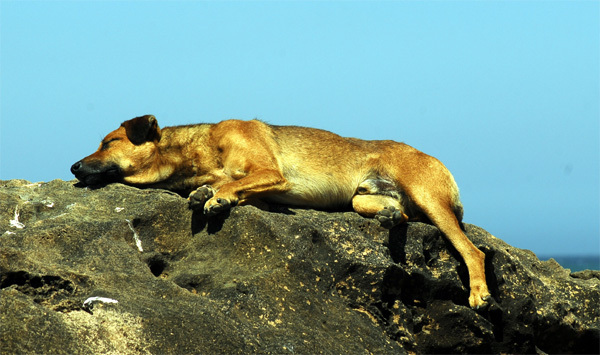 They are very safe sleeping at the rocks offshore at low tide. 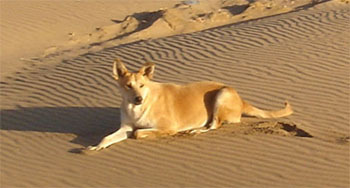 Dogs living near the forest and in the the blocks of Frina (sea) Sekkala (sea -duneforest), Tafouckt and Bouhaira (Lagoon forest) are in different shapes. They have infections of the skin and lice, bugs. Rarely that they have lost all hair. 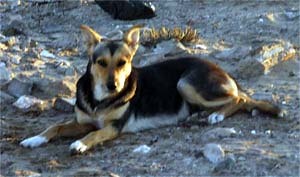 More seldom open wounds, injuries from fights with other dogs or accidents. Damaged limbs are common. Dogs who are injured are afraid and therefore it is advisable with precaution.
" 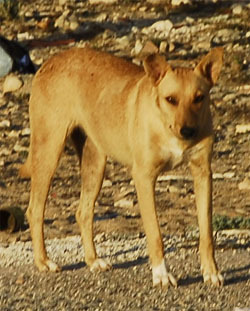 I have once been bitten by a dog and that was in a Eureopean mans house in a nearby village and I was told before this dog was unreliable - Anyway it happened and I went to the hospital Sidi Mohammed ben Abdallah and got a prescription of antibiotics and an ordonance to the local anti rabies center where I got antirabies shots. All free of charge. 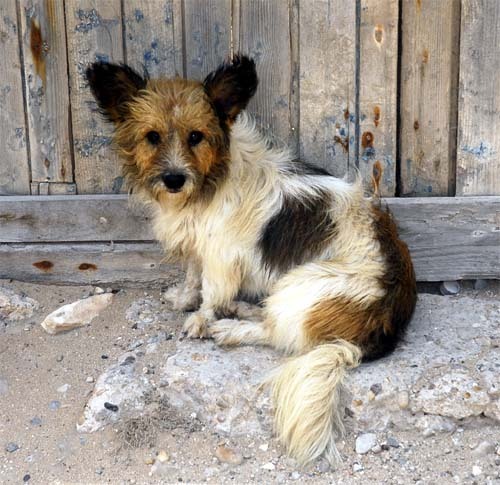 Mentally most dogs are shy and afraid of man. 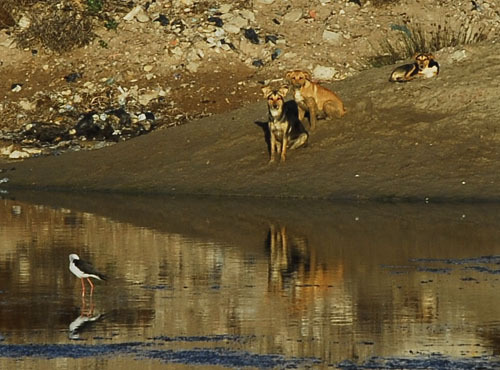 The dogs belongs to a flock in ranking. It is common a flock attacks a lonely outsider, who is week and submissive. 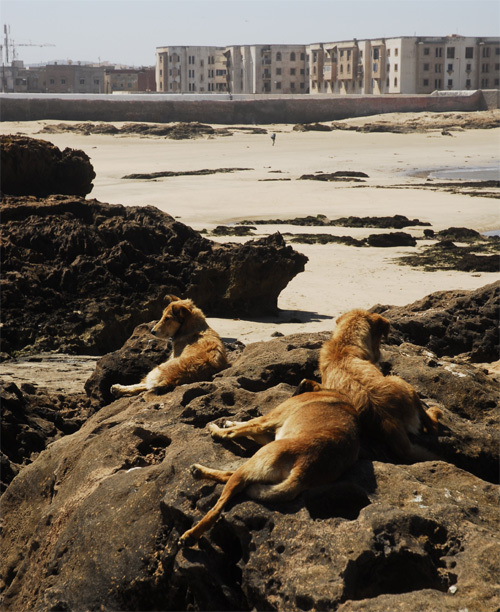 My impression is that the dogs in Essaouira really like to follow and be with people. They like to live in the blocks with us. They like to play and walk with us. The dogs are educated to behave in a proper way. They understand signals. Example: If you meet a dog and are afraid. You can bend down as you are looking for a stone, and then they dog will go away. " 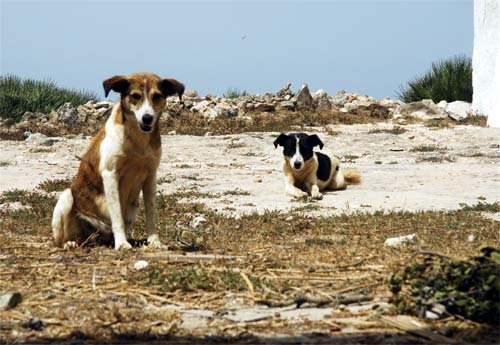 Killing dogs does not prevent or control rabies. 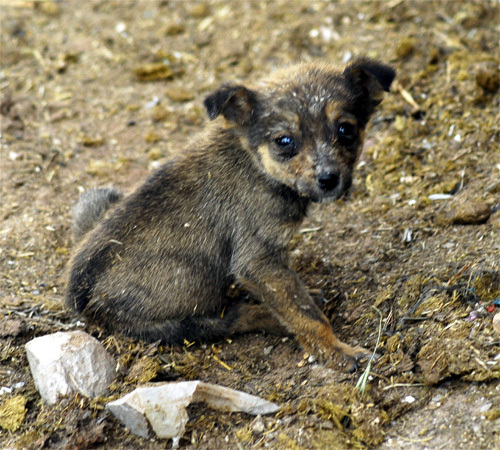 An estimated 20 million dogs are killed every year to try and control rabies, but it has little effect on controlling the disease. 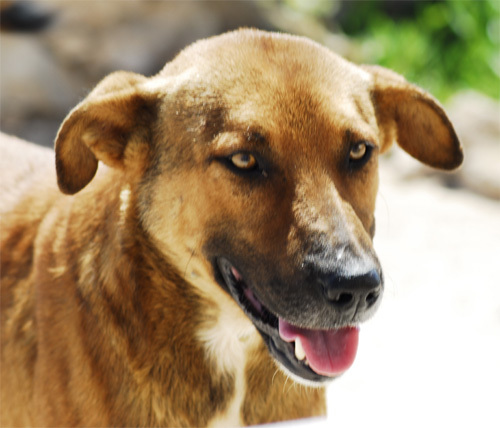 The best way to control rabies is to vaccinate dogs regularly. 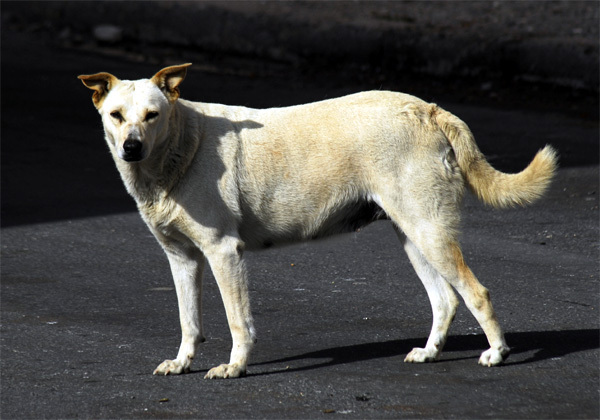 The rabies virus is primarily transmitted in the saliva when a rabid animal bites another warm blooded mammal. 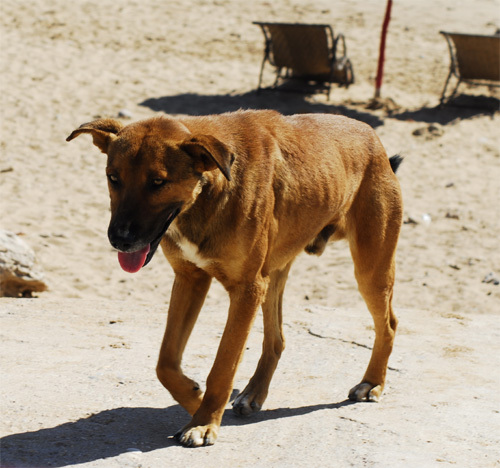 Scratches from an infected animal can give you rabies because an animal's claws have saliva on them. 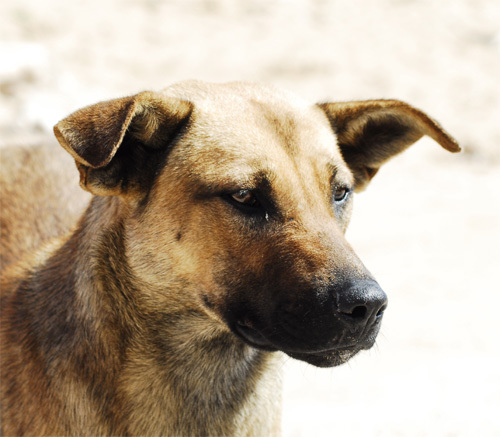 If an animal has rabies, it often drools excessively, and the saliva drips on its claws. 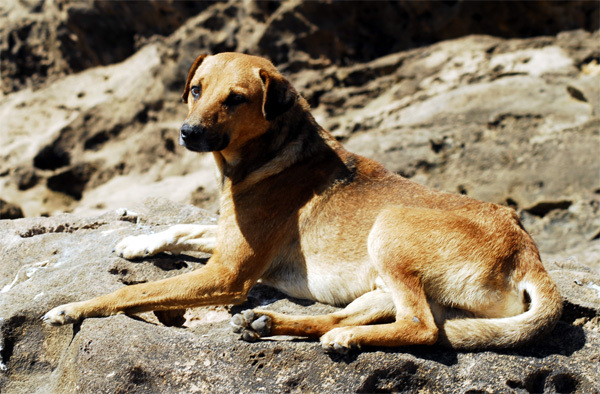 An anti-rabies vaccination can only prevent rabies if it is given to the victim before the virus reaches the nervous system. 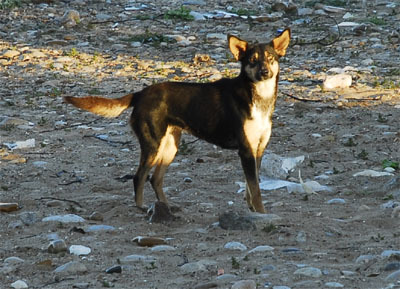 There are no definite external signs of rabies before the virus has reached the nervous system. 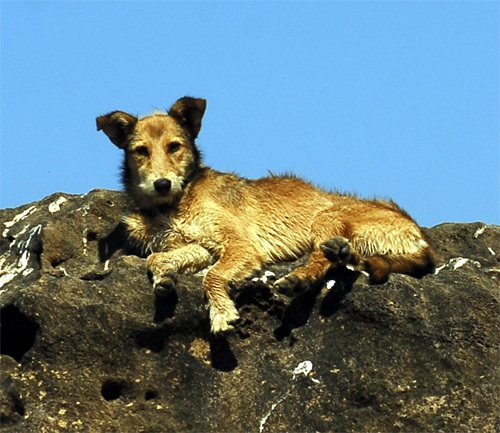 The vaccination cannot cure rabies once the clinical symptoms appear in the victim. 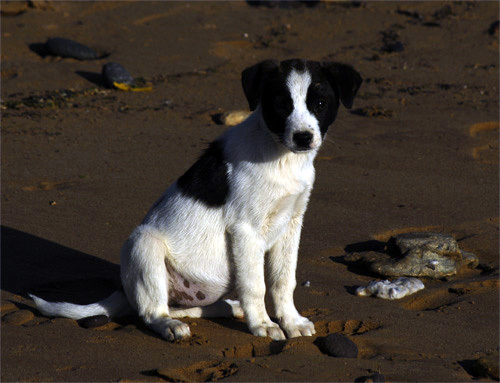 Rabies vaccination is only effective during the incubation period. 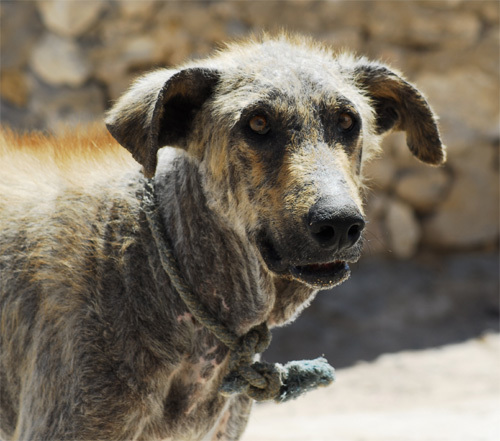 If you are bitten by a suspected rabid animal you should wash the wound with soap and running water (from a tap or poured from a jug) for at least 15 minutes and then go to a clinic for further treatment. 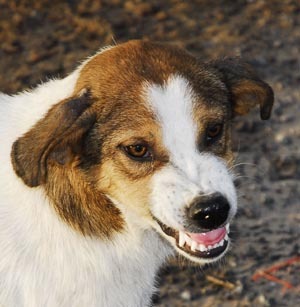 There is NO test to diagnose rabies before the symptoms appear. 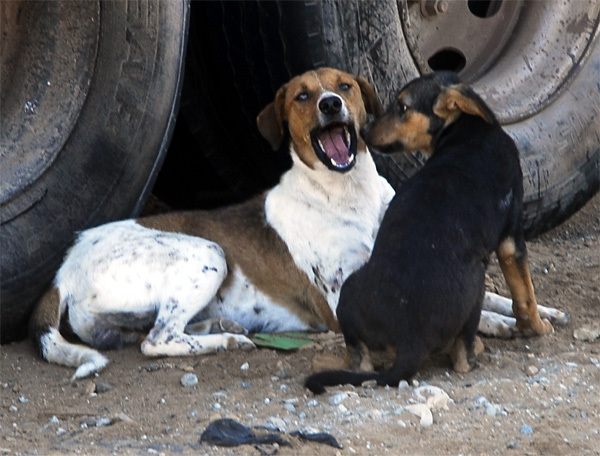 Remember: Rabies cannot be cured once the symptoms appear in a person, but the person can be made comfortable and given medicines to help relieve the suffering, which can also be a comfort to the patient’s family. How to avoid dog bites. 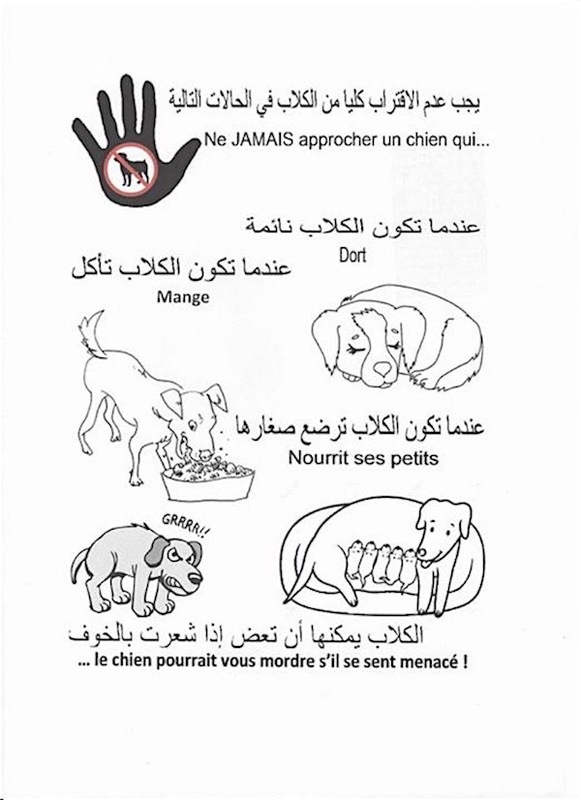 Leave dogs alone when they are eating or near food. Don’t grab a dog, as this can frighten it. Never surprise a sleeping dog. 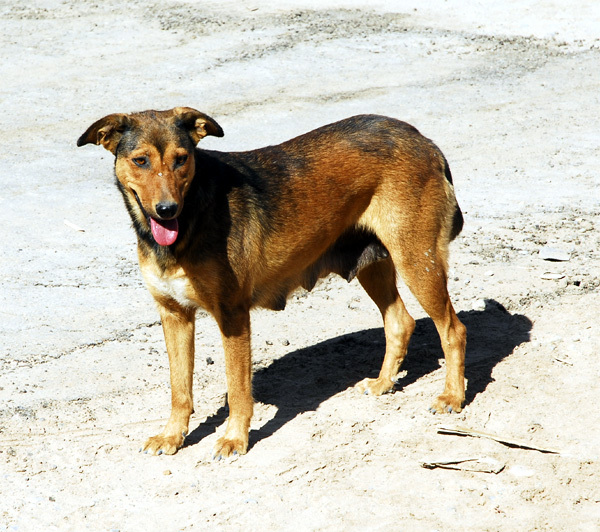 Don’t enter a strange dog’s yard without the owner being present and the dog being aware of your presence. Don’t touch any dogs you don’t know or that don’t know you. 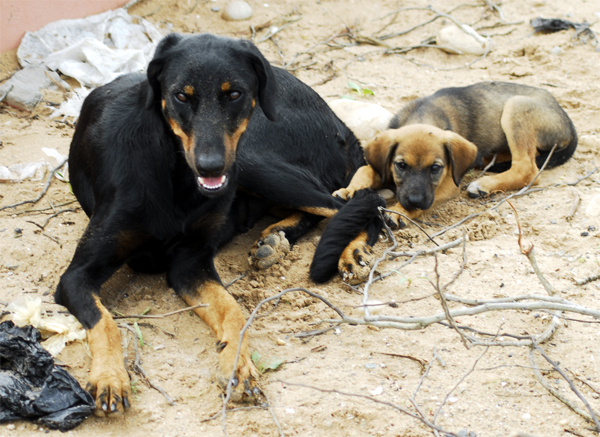 Don’t play with a dog with puppies, especially while the mother is still feeding them. 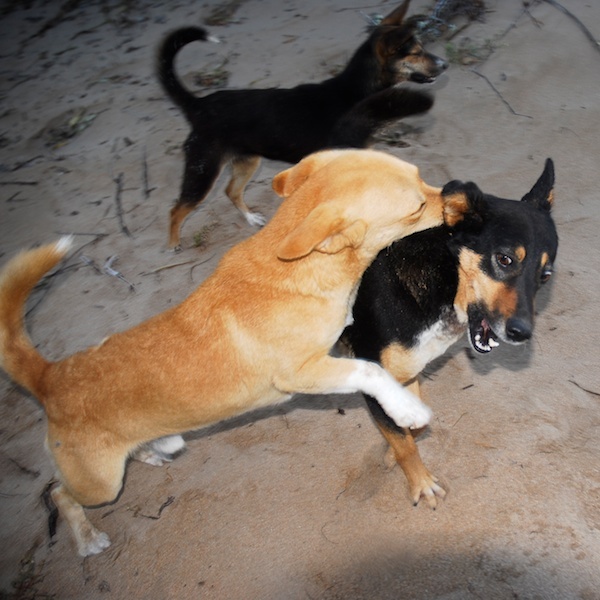 Don’t run away from strange dogs, as this can make them more likely to attack. Just stand still when you are afraid of or meet a strange dog. 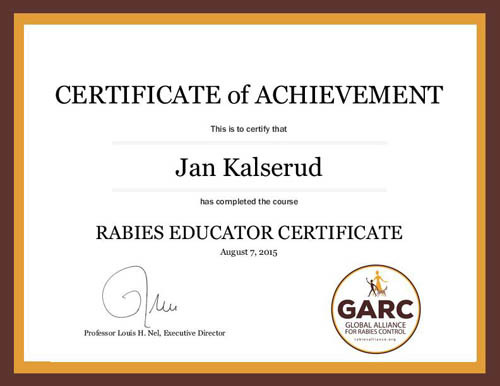 Take the GARC online course and get a Rabies Education Certificate! Near the Green Wall where the forest and the Bohaira Lagoons begins. can start from the "Green" belt (wall). 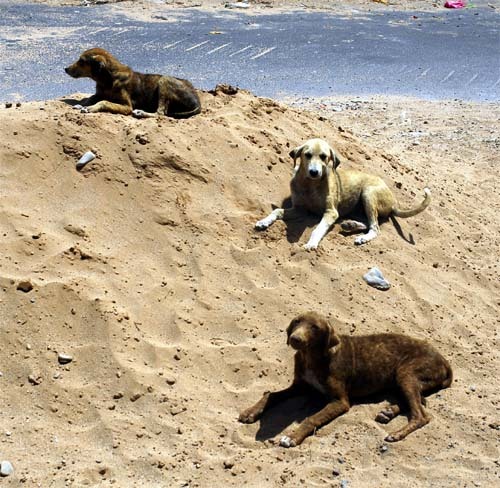 Dogs Bhar on the rocks outside the ramparts of medina. 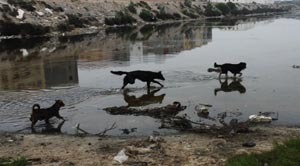 Bhar dogs at high tide evening. afraid of fysical contact but very close spiritually.